Naples Area Board of Realtors® (NABOR) has just released the real estate market report for October 2016 compared to October 2015 for residential real estate transactions in the Naples area. Despite an increase of transactions using mortgages (44%), 65% of transactions are cash sales in the Naples area. Overall pending sales increased 14%. Pending sales of condominiums from $500,000 to $1 million increased 30%. Overall closed sales decreased 7%. Closed sales of condominiums from $1 million to $2 million increased 80%. 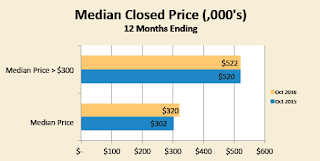 Closed sales of single-family homes in the $300,000 to $500,000 category increased 21%. Overall median closed price increased 6%. The Naples area real estate report for October shows a six-month worth of inventory, which make an healthy level of choice for buyers. The increase in days on the market (+15%) has been affected by some overpriced properties and shows that sellers must price their properties in a more realistic way in today's market.